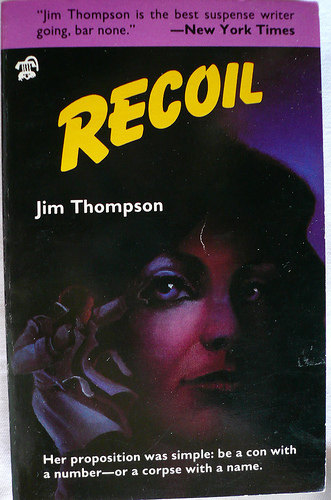 This isn’t Thompson’s best, this is no Grifters, Getaway or Killer Inside Me. However, even Thompson not at his best is better than many during the era. An angel comes to spring him, in the guise of Doc. Doc acts like he is doing a good deed to atone for his sins, and says Pat got a crappy deal on the sentence. Doc has alos enlisted the help of a Senator for the parole, securing Pat a government worker job. Enter Doc’s wife who isn’t his wife, some shady characters, textbook salesmen, and a private ye Pat hires to find out the real reason Doc sprung him. The gumshoe winds up dead and the cops finger Pat for it. Before Pat goes back to the hoosegaw, he wants to know what the hell this is all about. It seems convoluted at first, Doc swindling some money to get a certain textbook banned from the schools so the competing publisher can get that lucrative state-wide grant, selling thousands of textbooks at high prices. But what really is going on, the Doc using that bribe money to guy ten life insurance policies on himself, fake his murder and make it look like Pat did it, and hiding out for a year as his real wife collcts the $100,000 double indemnity payouts. Yes, it gets Chandler-esque in its strange crime plot, and kind of corny at the end with a two-page “happily ever after” ending where Pat gets an investigator job for foilibg Doc’s plans, and winds up with Doc’s wife as his own. But a fun read, more goofy than dark. 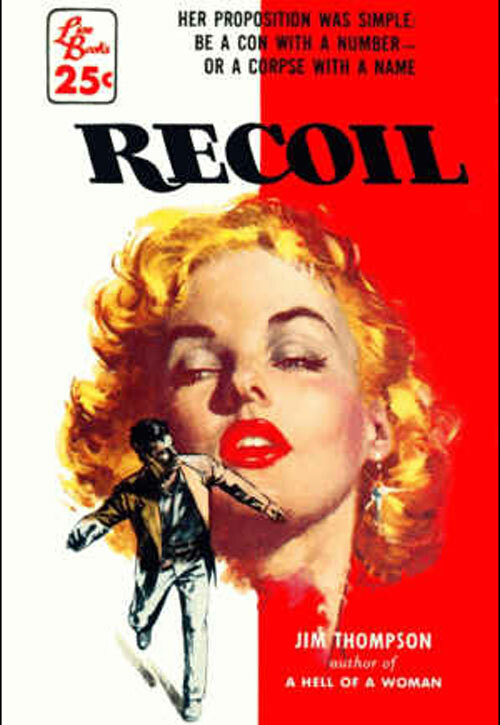 This entry was posted on March 30, 2011 at 4:26 am and is filed under crime noir, noir fiction, pulp fiction, Vintage Sleaze Paperbacks with tags con game, insurance swindle, Jim Thompson, patsy. You can follow any responses to this entry through the RSS 2.0 feed. You can leave a response, or trackback from your own site. Slowly I’m trying to build up my Thompson collection of those original Black Lizard mass-market paperbacks. Of course the early ’90s reprints have wonderful b&w photography on their covers, but I kinda hate trade paperbacks.